GeoPlus all-organic infill installation at RFK High School. AUSTIN, TX (June 27, 2016) – Hellas is on a mission — a mission to make a difference not only for the world today, but for generations to come. The leader in sports construction and athletic surfaces, Hellas will be attending the 2016 Green Sports Alliance Summit in Houston this week to launch a green initiatives campaign and to continue education on green practices and technologies. The event is the world’s largest and most influential conference for the world of sports to discuss ideas and practices of sustainability and advancements in the field. Speakers include Carl Mittleman, President of Aramark Sports and Entertainment, Dave St. Peter, President of the Minnesota Twins, Anya Alvarez, former professional golfer, and other influential members of the sports industry. Hellas has always practiced using eco-friendly, locally sourced, and recycled materials and resources in order to reduce the carbon footprint. To provide the best sports surfaces and athletic facilities, Hellas continues to research and develop new technology to make products and practices greener. Hellas was the first major U.S. turf manufacturer to remove isocyanate and solvents out of the synthetic turf field installation process. In-house chemists and internal manufacturing of non-toxic polyurethanes are the foundation of quality products for top-notch sports facilities. Hellas’ products contain no heavy metals or toxins, providing environmentally friendly running tracks , synthetic turf systems, and water-based acrylic court surfaces. Before project design begins, Hellas evaluates sustainable options after performing a survey that provides information regarding topography, existing vegetation, and a geotechnical analysis on the project site’s soil consistency. Once construction begins, Hellas maintains a sustainable project site by reducing pollution from construction activities through controlled soil erosion, waterway sedimentation, and airborne dust by performing a Stormwater Pollution Prevention Plan (SWPPP). Effective and planned drainage systems aid in reducing runoff and maintaining a controlled water balance on the job site. Through the exclusive Realfill™ synthetic turf infill and epiQ Tracks® all-weather running track surfaces, over 25 million tires are recycled every year, reducing the build-up in landfills. In addition to the use of these recycled products, a client can upgrade their synthetic turf system to GeoPlus all organic infill. 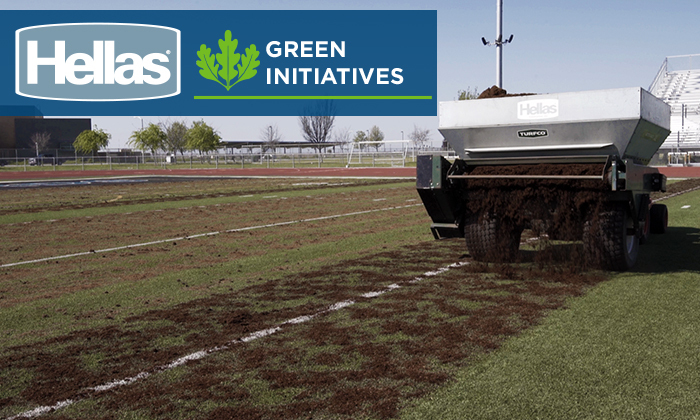 By the end of 2016, Hellas will have installed 35 synthetic turf fields with GeoPlus all-organic infill across the country. These installations include Weston Regional Park in Weston, FL, City of Gaithersburg Lakelands Park in Gaithersburg, MD, Madera High School in Madera, CA, and Flour Bluff High School in Flour Bluff, TX. Hellas’ synthetic turf systems reduce outdoor water consumption for athletic and landscaping projects. Realfill infill requires no irrigation, while the all-organic GeoPlus infill, composed of coconut fibers and cork, reduces water consumption by up to 90%. In addition to outdoor sports field water reduction, for Design/Build projects , Hellas can reduce indoor water use in concession stand facilities and restrooms by installing low-water-consumption fixtures and fittings. As a finishing touch for stadium construction, use of LED lighting is often installed to provide ample sports field lighting with at least a 50% saving of energy costs. Hellas prides itself in being a socially responsible player in the sports construction industry, by using their capability and knowledge to meet client’s product and construction requirements for LEED certification. For more information on Hellas’ green initiatives, please visit www.hellasconstruction.com/About/Why-Hellas. Home Office : Hellas Construction Inc.
12710 Research Blvd. Suite 240, Austin, TX 78759.